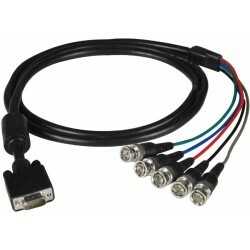 Connect a VGA port to a monitor with 5 BNC connectors up to 6 feet away. Connect a VGA port to a monitor with 5 BNC connectors. Perfect for larger, high-resolution monitors. Color-coded ends for easy identification. Male 15HD to five male BNC connectors. Interconnect devices with male BNC interfaces.